Last Sunday, the Eagles and their fans embarked on a “3-hour tour” (as they used to say on Gilligan’s Island) which turned out to be a roller coaster ride that swung across virtually every gamut of emotions. On two separate occasions, it looked like the Cowboys were on the verge of losing, yet both times, Dallas managed to keep the game alive, which eventually made the difference in a 24-23 victory over the Redskins. With Washington holding a 23-14 lead approx. midway through the 4th quarter, and the Cowboys faced with a 4th & 6 at the Redskins 40, quarterback Tony Romo completed a 20-yard pass across the middle to keep the drive alive. More importantly, it looked like a Cowboys loss was imminent after Dallas went from a 2nd & goal at the 1 to a 4th & goal from the 10 with only 1:16 left to play. Instead, Romo found DeMarco Murray at the 2 yard line, and, with just enough momentum to carry him into the end zone, kept the Cowboys alive for at least one more week. Eagles fans, jubilant at the thought of clinching the division on Sunday night against the Bears when the Cowboys faced 4th & goal, must have felt as if their “buzz” turned into a hangover almost instantaneously, with the knowledge that last Sunday’s game suddenly did not mean nearly as much. Now, the Eagles had to win at Dallas no matter what happened last Sunday night at the Linc. And later we found out that it was Chicago who had everything to play for, while the only advantage the Eagles could gain was for seeding purposes…which only holds importance IF the Eagles win this Sunday. But it was the Birds who played as if everything depended on the game, while the Bears looked like THEY were the ones who rested their starters and trotted out a high school junior varsity team as replacement players. Chicago looked disinterested, disheveled, and just plain discombobulated, and by the middle of the 3rd quarter, Eagles fans, while enjoying the offensive prowess of their team, still held their collective breath, hoping, PRAYING, that LeSean McCoy or Nick Foles would not lay motionless on the field because of an injury that would take more than a week’s recovery time. Perhaps it was to remove the bad taste out of their mouth after last week’s loss to the Vikings. Perhaps coach Chip Kelly, after watching his team practice to play a meaningful game, wanted to give them the chance to do so. Or perhaps it was to gain a #3 instead of a #4 seed, which the Eagles will capture if they win their division come Sunday night. There is validity to that argument. While both the #3 & #4 seeds play at home in the 1st round and on the road in the 2nd (assuming they win their first game), the #3 seed, in theory, plays the worse of the two wild card teams. Win that game, and you go on the road to play the 2nd best team in your conference and not the first (again, in theory). By holding the #3 seed, the Eagles would currently play the New Orleans Saints (an awful road team) at home in the 1st round as opposed to the San Francisco 49ers, who are more adept at playing on the road outdoors. Win that game, and the Birds would currently go on the road to Carolina in the 2nd round (a very winnable game) as opposed to going to Seattle and its “Monsters of Rock” concert decibel level at CenturyLink Field. Make it to the NFC championship, and the Birds could play at home if the #4 or #5 seed also advanced that far. Start the playoffs as the 4th seed instead, and you have to hope that the #6 seed advanced just as far (not very likely) to have that same opportunity. Sure, I’m getting ahead of myself, as the Eagles first need to win this Sunday, but why not dream a little with the way this season is going? As for Dallas, Santa dropped a lump of coal into the Cowboys playoff stocking, when it was discovered that QB Tony Romo may be out for the game (and for an extended period of time) with a herniated disk. But while all the “Romo-sexuals” (the Tony Romo supporters) may be crying in their eggnog at hearing such news, the Eagles would do well not to relax and take this game lightly. While Cowboys backup Kyle Orton may not be as elusive as Romo, he also may not have the “chokability” (is that a word?) of Romo either, who has gone 1-6 in playoff and regular season elimination games. ..nothing to write home about. Niners at Cardinals 4:25 PM FOX – Had the 49ers lost to the Falcons on Monday night, this game would have been, essentially, a playoff game for both teams. Instead, the Niners are already in the playoffs, with a chance to get a bye, and possibly home field advantage as well, for which they will need three French hens & two turtle doves along with a partridge in a pear tree. The Cardinals need a win and have to hope that Tampa can pull off an upset in New Orleans…otherwise, the Cardinals could end up 11-5 or 10-6 and be watching the playoffs at home in the land of the cactus. Packers at Bears 4:25 PM FOX – For the Bears sake, hopefully they can snap out of their sleepwalk just in time to get up for this regular season winner-takes-all game against the Pack, who might have Aaron Rodgers back and could make a deep run in the playoffs as the #4 seed. If that is the case, I’ll be singing “I’mmmmm dreaming, of an Eagles-Packers championship…just like the one in 1960″…. Eagles at Cowboys 8:30 PM NBC – Based on comments they made during last week’s Eagles-Bears Sunday night game, the NBC broadcasting duo of Al Michaels and Cris Collinsworth seem to have a “bro-mance” going with Eagles head coach Chip Kelly. Or maybe it was the oversized picture of the Phillie Phanatic used to send in offensive signals that had them smiling? Either way, they both do a great job, though I will always defer to putting down the sound and putting on Merrill Reese and Mike Quick on the Eagles radio network…It’s GOOOOOD! 2) Hearing “Grandma Got Run Over by a Reindeer” on the radio. 4) Santa sliding down the chimney to deliver presents. 5) The Cowboys sliding down the NFC East standings as Tony Romo delivers another fatal interception. Once again, just around the time that the Christmas trees are decorated and the eggnog is flowing freely, the Cowboys began to freefall, going from a contender to a pretender. Last week, the ‘Boys held a commanding 26-3 lead over Green Bay at halftime, only to have it slip away when Cowboys QB Tony Romo threw not one, but two game-changing interceptions, eventually leading to a 37-36 fall from ahead defeat. The last two seasons, it has been the Giants and Redskins, respectively, that have won the division as a result of the Cowboys implosion, and this year looks to be the Eagles turn as they try to make the playoffs in Chip Kelly’s first season, a feat that even the “Ghost of Christmas Future” could not foretell. Don’t know what it is that has cursed Tony Romo…the guy puts up good numbers and can throw 5-6 touchdowns in a game, yet he’ll throw an interception at the most inopportune time, eventually leading to a Cowboys loss. Back in 2006, the Cowboys were a chip shot field goal away from winning a wildcard playoff game on the road against the Seattle Seahawks when Romo, who was then the holder on field goals and extra points as well, botched the snap, leading to a Cowboys playoff loss in his 1st year as the Cowboys starter. Who would have known then that Romo and the Cowboys would amass only one playoff win in the next six seasons? Perhaps it’s the ghosts of “Cowboys past” that are cursing Jerry Jones and trying to get him to see the error of his ways in remaining the general manager of his football team. It was Jones, after all, who caused former Cowboys coach Jimmy Johnson, the only successful coach he’s had to date, to depart Dallas. 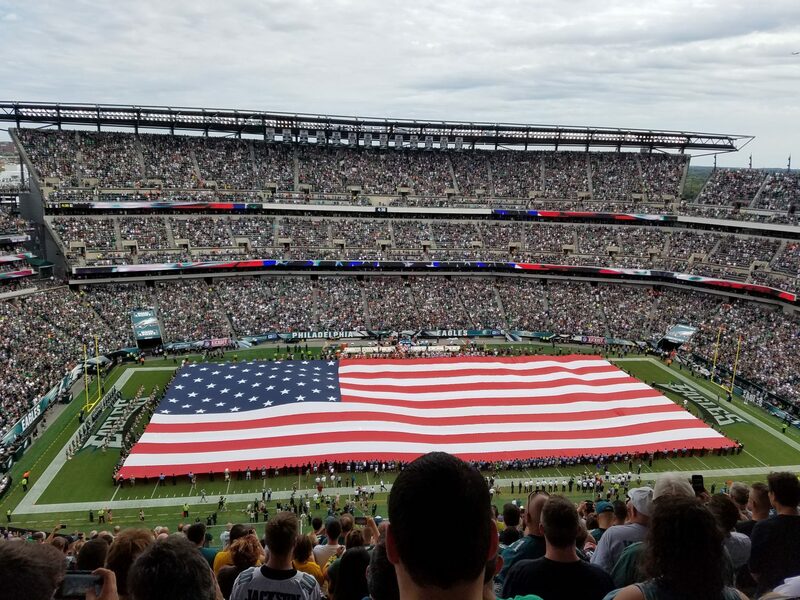 The only thing bigger than Jerry Jones ego is his stadium, and while it may hold all the technological bells and whistles, it is an awful place for the average fan to actually watch live action, and doesn’t hold any ground when compared to Lincoln Financial Field. Meanwhile, back at Broad & Pattison, the Eagles were very much in the holiday spirit last week, as they gift wrapped a win for the Vikings. And while Minnesota’s record was nothing to write home about, Eagles play-by-play man Merrill Reese made an interesting observation before kickoff last week that if a football game lasted 59 minutes instead of 60, the Vikings would have been 8-5 instead of 3-9-1. This wasn’t the Houston Texans the Eagles were facing but a team that had played it close for most of their games and, if taken lightly, had the ability to beat you. And they did just that. But with the Cowboys loss, the Eagles received their own Christmas present of sorts, and with it, a chance to clinch the NFC East this Sunday with a Cowboys loss to the Redskins Sunday afternoon followed by an Eagles win over the Bears on Sunday night. If both teams have something to play for, it could be a tight, close game, but by Sunday night, either one or both teams could be resting their starters for a game that might end up meaning very little (wonder if the boys over at NBC thought this one through before they flexed this into the Sunday night game). – They cannot get a wild card spot, which goes to the #5 & #6 seed. – They can only get into the playoffs as a division winner, which would give them either the #3 or #4 seed, depending on what the record of the NFC North winner is. They cannot move up enough to capture the #1 or #2 seed (and the 1st round bye that comes with them). – A Cowboys win against the Redskins and the Eagles would have to beat Dallas the last week of the season to win the division, no matter what happens this Sunday night. In that case, a loss against the Bears would make it likely that the Birds would become the #4 seed instead of #3. – For the Bears, a Lions loss against the Giants and a Packers win against the Steelers (both played on Sunday afternoon) would render the Eagles game meaningless for the same reason, as the Bears would need to defeat the Packers the following week to win their division, regardless of what they do against the Eagles. – If the game ends up meaningless for both teams, the only thing the outcome would affect is the seeding between #3 & #4…got that?? Colts at Chiefs 1:00 PM CBS – While both of these teams have already clinched playoff spots, the Chiefs still have a shot at winning their division and getting home field advantage throughout the playoffs, while the Colts still have an outside shot at a 1st round bye. Saints at Panthers 1:00 PM FOX – A win would give the Saints the NFC South title and a 1st round bye in the playoffs. A Panthers win would put them in the drivers seat for the same, though they would still need a win or a Saints loss the following week as well. The Saints are an offensive juggernaut when they are playing at home, but unfortunately, this game is in Carolina. Cardinals at Seahawks 4:05 PM FOX – A win would give the Seahawks home field advantage throughout the NFC playoffs. While the Cardinals future is bright under new head coach Bruce Arians, they still need some help to make the playoffs in 2013. Patriots at Ravens 4:25 PM CBS – With neither team having clinched a playoff spot yet, and playoff seeding still in the air, this should be a dandy. Bears at Eagles 8:30 PM NBC – While this game is currently a marquee matchup, that could change before kickoff based on how other games pan out.